‘ESSEX ERUPTION’, the second of the two-event extravaganza during March to celebrate Steve Goodwin’s first anniversary as a promoter, sees Romford Cruiserweight prospect Tony ‘Conqueror’ Conquest, International Masters Light Middleweight Champion Yassine ‘The Showman’ El Maachi and Newmarket’s ‘Phat’ Pat McAleese co-headline the mega show at the Goresbrook Leisure Centre in Dagenham, Essex on Saturday 19th March 2011. Since turning pro, in September ‘09, Conquest has convincingly won all five of his fights. However it was his last outing, against the highly experienced battler Hastings Rasani, that Conquest showed his true potential. Right from the start Conquest oozed confidence and made easy work of controlling the fight. As Conquest showcased his range of combinations Rasani just stood his ground, seemingly content to bide his time. Conquest was savvy, using sharp attacks and swift movement to prevent Rasani being able to mount any sustained attacks of his own. After six rounds Conquest was rightfully declared the winner by a clear 60-54 points margin. 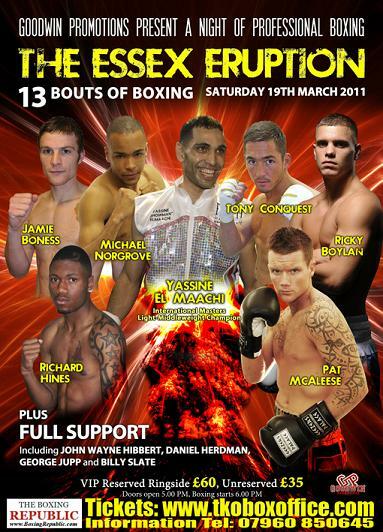 International Masters Light Middleweight Champion Yassine El Maachi gets his first outing of 2011, in a non-championship warm up bout, against a yet to be named opponent. El Maachi is hoping to secure a place in the upcoming Sky Televised Prizefighter series in May. El Maachi, the current International Master Light Middleweight Champion, successfully defended his title against European #4 ranked Jimmy Colas at Steve Goodwin’s magnificent ‘Judgement Day’ event back in December. 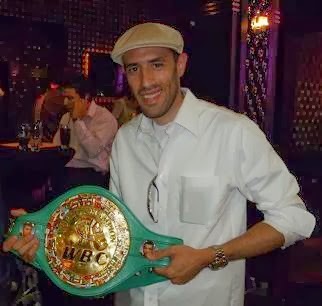 To describe Yassine’s performance as exceptional would be an understatement, awe inspiring may be a better statement but still wouldn’t get across just how slick, classy and totally dominating his performance over the former EBU-EU, and current WBC Latino Light Middleweight champion was. From the first bell El Maachi teased and frustrated Colas with his unorthodox attacks. Time after time El Maachi would trip the light fantastic before letting rip with a flurry of punches, leaving Colas lashing out at his shadow. Throughout the contest El Maachi picked off Colas at ease, with wickedly fast uppercuts and combinations, before sashaying away before the hapless Colas could even respond. As the fight progressed El Maachi stepped the pace up and often showboated as the baying crowd chanted ‘Yassine, Yassine, Yassine’. In round eight El Maachi let rip a scintillatingly fast and vicious right-left combination that rocked Colas to the core, however before El Maachi could finish Colas off the bell rang to end the round. El Maachi shifted to an even higher gear for the final two rounds, in doing so he put on one helluva show and picking off Colas with exquisite uppercuts, right crosses and blisteringly fast combinations. A knockout finish looked to be on the cards but in the end Colas showed his durability by surviving the constant onslaught. Referee Jeff Hinds scored the bout a resounding 98-92 to Yassine El Maachi. Newmarket’s Light Middleweight prospect ‘Phat’ Pat McAleese makes his welcome return to the ring, after suffering his first loss against Lee ‘Lightning’ Noble at Steve Goodwin’s superb ‘It’s Personal’ event in September. For almost nine rounds McAleese not just outworked Noble, he plain dominated him. Noble’s work rate was exceptionally poor, he seemed content to cover up and absorb the constant barrage of punches, only occasionally responding with the odd jab or flurry here and there. In the dying seconds of the ninth round Noble let rip with a peach of a right uppercut. It was a near perfect shot and dropped McAleese on the spot. Up until that fateful moment McAleese had been winning the round, as he had done the eight that preceded it. On the 19th March McAleese will be facing another tough battle as his opponent will be Germany’s # 26 ranked Marcen Gierke, who is a three time German title challenger. McAleese will be determined to make a statement on his return as he has already being hinting at a trilogy fight with Noble in the very near future. 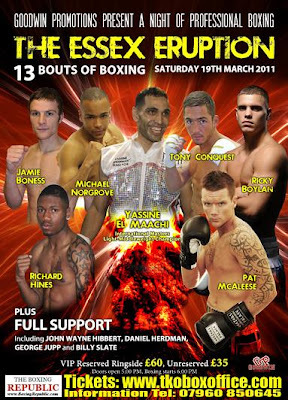 Explosive all action fighters seem to be the standard at Steve Goodwin promoted shows and as such it comes as no surprise that supporting the headlining trio is a ten bout undercard featuring some of the most exciting local young fighters looking to make their mark in 2011. Woodford Green’s unbeaten Light Middleweight Michael ‘The Zambezi Hitman’ Norgrove gets his fifth outing, against the seriously tough Czech Jan Balog. Pat McAleese’s Ultrachem TKO team mate Daniel ‘Hurricane’ Herdman, from Stevenage, is set to face Halesowen hardman Kevin McCauley. Another of the young prospects from Johnny Eames’ TKO stable, Carshalton’s ‘Pretty’ Ricky Boylan, gets his third outing against Nuneaton bruiser Kristian Laight. In addition Romford Light Heavyweight Billy Slate, unbeaten Belvedere Featherweight ‘Saint’ George Jupp, Biggleswade Light Middleweight Jamie Boness, Rainham Super Featherweight Richard Hines and more will be in action against yet to be named opponents. Tickets for ESSEX ERUPTION at the Goresbrook Leisure Centre in Dagenham, Essex on Saturday 19th March 2011 - and Part 1 of the Goodwin Anniversary Celebrations UNLEASH THE FURY at the York Hall, Bethnal Green, London on Saturday 5th March 2011 - are priced £35 (Unreserved) or £60 (Ringside) and on sale NOW.